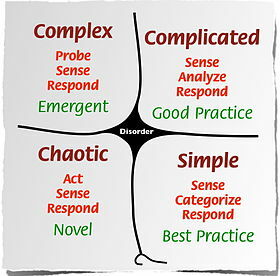 In an earlier blog I wrote on complexity in project management and the Cynefin© model. Target of this blog is to deepen the understanding in applying Cynefin©–based approaches to complex projects. My appliance of Cynefin© is pragmatic. As I am not a theorist, I might get things wrong, as long as it works for projects. A problem is either simple, complicated, complex or chaotic. A fifth type is disorder, which stands for such problems of which we can’t tell in what domain the problem belongs. In this blog I don’t address disorder problems. The figure below is a graphic representation of the Cynefin© model from Wikipedia. Simple problems are characterized by a known and well established cause-effect. Don’t waste any time, just plan de corrective action as you know it’s outcome. E.g. if a team member lacks experience in a specific task, you send him to a course or training, or assign an on-the-job coach. When developing simple software functionality, any development type will do (e.g. waterfall or iterative). Complicated problems cannot be solved in the same manner as simple problems. For this an expert or team of experts analyze the problem to provide a solution. A typical complicated problem is how to structure known data in a database or set up a project in a stable problem domain. The project knows its stakeholders. Once the set of requirements are defined they are more or less stable. Project, organization and customer are confident in a positive result. Regarding software functionality, also complicated problems may be addressed by any development type. Although here the risk for change and (upfront) unknown additional problems, might call for a iterative based development. Iterative based development enables emerging functionality, thus reducing late and fundamental changes in design and code. When projects face complexity as well as many and largely unknown and varying requirements, both customer and organization are faced with a big uncertainty and risk regarding the outcome of the project. The high level work breakdown structure is largely based on expected work to be done. Estimations on effort, resources and needed time to determine project costs is at this point a major guessing game. Typical for these large projects is that only at the end of the project, both project, customer and organization are able to explain how and why the project evolved as it did. Project outcome emerged from running the project. Prediction up front was not possible. These projects are typically located in the complex domain with a probe-sense-respond approach. In practice this means that at project outset, the objective is provided together with the why. Then the project set’s out to identify the major business value and starts working on these. In order to identify as much needs, wishes and constraints as possible a narrative approach can be applied. In this initial narrative phase the project sets up a website where all stakeholders are invited to share their stories. The stories are provided a title and provided additional meaning (or signifying). Note that up front it is not known how many narratives or requirements are necessary. This is only know in retrospect. The stories form the basis on which the project defines a detailed set of requirements. Because in these types of projects many requirements emerge only during project execution, these basic set of stories are continuously revisited at regular intervals. In software development typical iterative approaches with high level of stakeholder involvement is used for these types of projects. It becomes directly very clear that both on the stakeholders side as well as on the organizational side, embracing slow-growing certainty and emerging understanding of project deliverables, is critical for success. In the complex domain project outcome emerges from project execution. The problem domain is known and understood. Complexity is based on the fact that at the outset, not all needs, wishes and constraints are known. Even stronger, perhaps not all stakeholders are at that point known. Projects in the chaotic domain are projects in an unknown uncharted domain. There not yet any experts to tell the project what is the best approach. So the defined approached is act-sense-respond. Just start working in any direction, ensure the involved cost, time and risks are limited. At regular intervals the result is evaluated. Positive outcomes are strengthened or continued. Negative results are stopped. Slow but certain the project learns and builds expertise. Both customer and organization support and learn with the project. For both the customer and organization, the challenge is how to fund these types of projects. I will get back later in this aspect. I’ll also address the use of narrative in requirements definition in a later blog. Warning. As in all models it is important not to follow the model but to understand it. Applicability works as long as it works for you.